Visitors to the Church of St. Nicholas in Tallinn, Estonia, will recall the representation of death as a bony, dark figure with a skull, as depicted in Bernt Notke's famous canvas, Danse Macabre (c. 1460). Many others are acquainted with the image of death as the reaper in Ingmar Bergman's dramatic film The Seventh Seal (1957). Through the ages people have tried to personify death by giving it a humanlike form. Personification is used in this context as the mental transformation of inner thoughts and feelings into autonomous figures. The term personify is defined as giving inanimate objects or abstract ideas human characteristics. Formed in this way, death personifications can be considered culture-bound channels to transfer invisible phenomena into external patterns. In the ancient world, life and death were perceived as two forces of the Great Mother, the oneness of everything. Life was associated with the Good Mother, and death with the Evil Mother. According to the psychologist Erich Neumann, death is the hungry earth, devouring its own children. In classical Greek tradition, the unity of life and death is split into opposites. Life is personified as feminine, and death as masculine. Death is named Thanatos, the twin brother of Hypnos, the god of sleep. His mission is to accompany the departed to Hades, the underworld, where the aged boatman Charon ferries them across the Sinister River, which separates the underworld from the world above. In Greek mythology, death is considered inevitable, but not purely evil. Illustrations on Greek vases depict Thanatos and Hypnos as two young men. In European art, literature, and iconography, Thanatos is often portrayed as an earnest, winged youngster holding an extinguished flare. In Judeo-Christian religion, death is considered exceedingly evil. It is not personified as a human-like figure; rather it is described by its actions. The Old Testament says that humans are cast down in the kingdom of death, which resembles Hades, where the wicked are punished. The Christian concept of death associates death with sin. Sin is regarded as opposition to the will of God, requiring repentance and God's forgiveness. Only in apocalyptic writings is death personified as a human figure, a pale horseman who kills people using violence. During the plagues (the Black Death) and wars of the fourteenth and fifteenth centuries, personifications of violent death were popular. Throughout this time there was a belief that the skeletonized dead rose from their graves and tempted the living of all ages and ranks to join them in a dance to the death. The "dance of death," or dance macabre, was an allegorical theme in art, literature, and music. It was first embodied in murals, then in woodcuts. The Parisian painter Guyot Marchaut published a portrayal of the death dance in woodcuts and verse (1486), which was circulated throughout Europe. Best known are the fifty-one drawings of the German painter Hans Holbein the Younger (1497–1543), where death is personified as a skeleton, and each individual dances through life embracing his own death. This theme of personifying death as a skeleton or a reaper has continued into the twenty-first century. In Sweden the dramatist August Strindberg's play The Dance of Death (1901) is filled with macabre medieval symbolism. Bergman's film The Seventh Seal personifies death as a man with a hood obscuring his face. In "La Mort et le Bûcheron" (Death and the woodcutter) the French landscape painter Jean François Millet depicts death as the grim reaper. Alfred Kubin paints death as a skeleton in "Blätter mit dem Tod." The Austrian painter Gustav Klimt personifies death in the flamboyantly dressed skeleton in his "Tod und Leben" (Death and life, 1916). Musical renderings of the personification of death include Totentanz (1864) by the Hungarian composer Franz Liszt, Danse Macabre (1874) by the French composer Camille Saint-Saëns, and La danse des morts (1940) by the French composer Arthur Honneger. In 1948 the researcher Maria Nagy observed that Hungarian children had a tendency to personify death as "the reaper" or "the skeleton," a figure that appeared in order to carry people off. Later research in the United States could not confirm Nagy's findings. American children showed no signs of personifying death. In Canada more than thirty years later, Richard Lonetto showed that children tended to personify death as exemplified through their drawings. In Sweden, Maare E. Tamm and Anna Granqvist observed that less than 10 percent of children and adolescents personified death. The personifications of younger children were ideographic, a "death man," while those of older children were formed from cultural symbols. All children personified death as masculine. Personification of death in adults is studied in the United States by Robert Kastenbaum and Carol Herman. In 1997 they found that females most often select "kind and gentle" imagery, as "the gentle comforter" or "the gay deceiver," while males are more likely to see death as a "cold, remote" person. Grim and terrifying personifications of death were infrequent. In Sweden, Maare E. Tamm found that a majority of the adults studied personified death as an old man, the reaper figure being the most apparent personification. 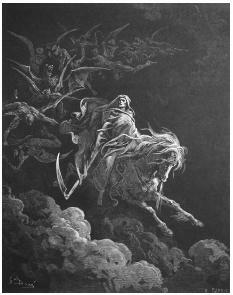 Similar to Gustave Doré's nineteenth-century engraving Death on a Pale Horse, death is most commonly personified as a skeleton or reaper by children and adults . Death has been personified through the ages; in the ancient world as a feminine figure, and from classical Greek civilization to the present as a masculine figure. When the plague raged throughout Europe, death acquired a violent, frightening, and macabre image. The image of the "grim reaper" is preserved in art and literature, and in people's minds, to the present day. It is hard to say how death will be portrayed in future decades, when new technology like the Internet and virtual reality introduces new ways of thinking in philosophy, theology, and the human mind. Certainly people will continue to personify death in some way because there is a universal tendency among humankind to understand the world as a humanlike entity, and personification of an image—in this case death—makes its qualities more palpable and less terrifying. Holbein, Hans. The Dance of Death. New York: Dover, 1971. Kane, Barbara. "Children's Concepts of Death." Journal of Genetic Psychology 134 (1979):141–153. Kastenbaum, Robert, and Carol Herman. "Death Personification in the Kevorkian Era." Death Studies 21, no. 2 (1997):115–130. Le Goff, Jacques. Medieval Civilization, 400–1500. Oxford: Basil Blackwell, 1998. Lonetto, Richard. Children's Conceptions of Death. New York: Springer, 1980. Neumann, Erich. The Great Mother. An Analysis of the Archetype, 2nd edition. New York: Bollingen Series/ Princeton, 1974. Sorvinou-Inwood, Chistiane. Reading Greek Death: To the End of the Classical Period. Oxford: Oxford University Press, 1994. Tamm, Maare E. "Personification of Life and Death among Swedish Health Care Professionals." Death Studies 20, no. 1 (1996):1–22. Tamm, Maare E., and Anna Granqvist. "The Meaning of Death for Children and Adolescents: A Phenomenographic Study of Drawings." Death Studies 19 no. 3 (1995):203–222.